STATEIMPACT PENNSYLVANIA – Freshwater mussels once thrived in rivers, streams and lakes across Pennsylvania. They provided a natural filter, cleaning up muddy water and allowing more sunlight into the waterways, which in turn provided a healthier ecosystem for aquatic life. 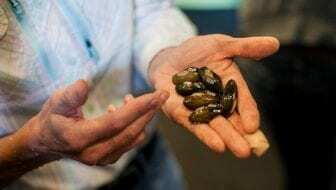 In an effort to restore those mussel beds, the state will invest $7.9 million for a new mussel hatchery in southwest Philadelphia’s Bartram’s Gardens. The PENNVEST funds will help the Partnership for the Delaware Estuary build the hatchery, which will begin operating in 2023 with the goal of producing 500,000 baby mussels each year. The adult mussel colonies will be placed in the Delaware and Susquehanna watersheds, focusing on streams where historically, native populations lived. Humans don’t eat freshwater mussels because they have too many parasites and toxins. But those mussels help clean muddy waterways by eating microscopic particles like clay, silt and algae. Algae provides food for the mussels. The silt and clay are combined with mussel mucus and excreted, sinking into the muddy riverbed at the bottom. Danielle Kreeger, science director for the Partnership for the Delaware Estuary, says freshwater mussels are the natural clean-up crews for rivers and streams. “So they’re big conveyor belts for material moving from the water column, where it’s a pollutant, to either transforming it so it’s not as polluting or locking it away,” she said. Kreeger says 95 percent of the regional streams she surveyed no longer have any mussel beds. Today, mussels are some of the most endangered species of animal. “And by losing that natural filter system in our river, that makes it much harder for us to keep the water clean,” she said. Kreeger says the Delaware River Basin has 12 native species of freshwater mussels and the scientific research on these animals is fairly new. One adult mussel filters 10 gallons of water each day. And she says research has found that macroinvertabrates and fish populations are enhanced in areas where mussel populations thrive.